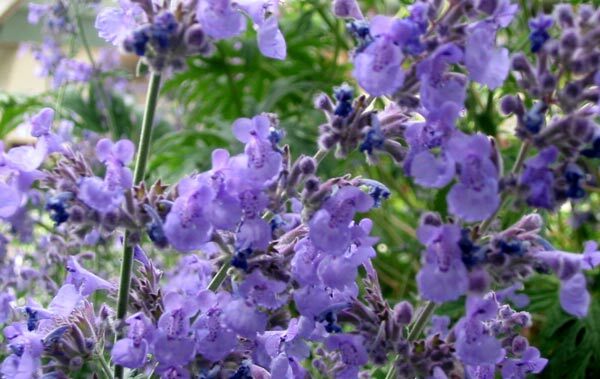 Catmint is typically used as an edging plant, often to accompany a flowery rose or perennials border. In my opinion it's a prettier edge-plant than Lavender. The whole effect is much softer and fluffier. The flowers are a pretty pastel blue, and just perfect with pink roses. Bees love them, and this is definitely another reason to grow it. The foliage is a blue-green in colour, with very pretty, tiny leaves. 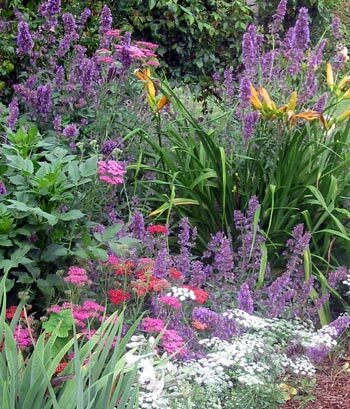 As a perennial it's hardy, tolerant of droughts and well-behaved. Catmint won't ever get out of hand or spread far and wide. And the fragrance is wonderfully minty - as you'd expect! I also grow a larger form of Catmint called Nepeta Six Hills Giant, which fills up spaces between the rugosa roses at the back of the glass-house. 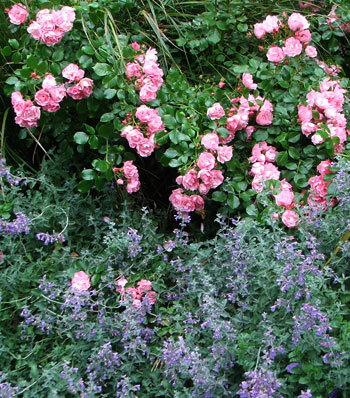 I like this variety very much - its tall flower heads mingle with the rose canes, but it doesn't cause too much shade. I often make cuttings of this variety to use in new gardens if I want feathery bulk. And if I remember to crawl into the undergrowth and trim it back in late summer it re-flowers for me. Of course I can't talk about growing catmint without mentioning the Moosey cats. 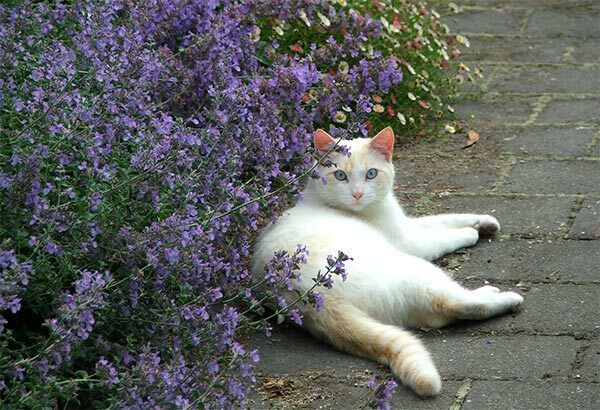 All the cats love to lie in the low growing catmint which I grow around the house patios. They sometimes nibble it, sometimes sit completely surrounded by its tantalising smells. Then they'll build comfortable looking cat-nests to sleep in during the warm summer months.